Investors fear widening protests against the government in Egypt could spread across the Middle East to major oil producers. Oil prices surged Friday as traders bid up prices on concerns that widening protests against the government in Egypt could spread across the Middle East to major oil producers such as Libya and Saudi Arabia. The price spike also was fueled by concerns that any interruption of shipping through the Suez Canal could add 6,000 miles to some oil shipments and raise the cost of crude oil delivery, analysts said. Prices shot up about $2 a barrel in less than half an hour as thousands of protestors took to the streets and clashed with police, burned cars and stormed government buildings in Egypt. By the end of the trading session oil prices were about 4 percent higher, at a bit over $89 a barrel. Stock prices fell sharply, while anxious traders bid up the value of the dollar and gold, typically safe-haven investments. The uprising in Egypt follows protests this month that forced out the president of Tunisia, who fled to Saudi Arabia. Anti-government protests also have rocked Lebanon and Yemen. "This looks like the Arab world's version of the flash crash," said Daniel Senor, a fellow for Middle Eastern studies at the Council on Foreign Relations. "If you look among the inputs that are fueling this revolt, including food prices and food shortages, I don't know how you fix that quickly." Despite market concerns about the potential impact of the widening unrest, there appeared to be no immediate threat to oil supplies. "Egypt doesn’t mean much on its own in terms of crude oil production or exports," said Tom Kloza, editor & publisher of OPIS, which tracks oil prices. "It is of course the key country for the operation of the Suez Canal which cuts 5,000-6,000 miles off the voyages of many European-bound tankers," he said. "But the real worries today are about violence and unrest spreading eastward into the Arabian Gulf. Whether one is a fan of (Egyptian President Hosni) Mubarak or not, one can at least suggest that it was a stable country on the edge of a region which has long been unstable." U.S. stock prices fell sharply from 29-month highs, partly because investors were nervous about the uncertainty in the Middle East ahead of the weekend. Investors also were disappointed by earnings from several widely owned companies including Amazon.com and Ford. The broad Standard & Poor's 500 index fell 1.8 percent. To quell the spread of violence, Egyptian officials shut down Internet and phone service, limiting the spread of information to other Arab states. But scenes of violent street clashes between protesters and police were beamed via cable television networks throughout the Arab world. The biggest threat would come from a spread of violence to major oil producers like Saudi Arabia, the world's largest exporter. While there long has been public opposition to the autocratic Saudi regime, the outbreak of widespread violence there appears much less likely, analysts said. "Saudi Arabia, unfortunately, will probably be among the last to change," Sephen Zunes, professor of politics and chair of Middle Eastern Studies at the University of San Francisco, told msnbc.com in an online chat. "As an oil-rich state, they can buy off a lot of potential opponents. In addition, the power of the hard-line Wahabbi clerics may make pro-democracy elements nervous about challenging the monarchy for fear at what might replace it." As of late Friday, Mubarak had not yet given a much-anticipated speech to the nation. 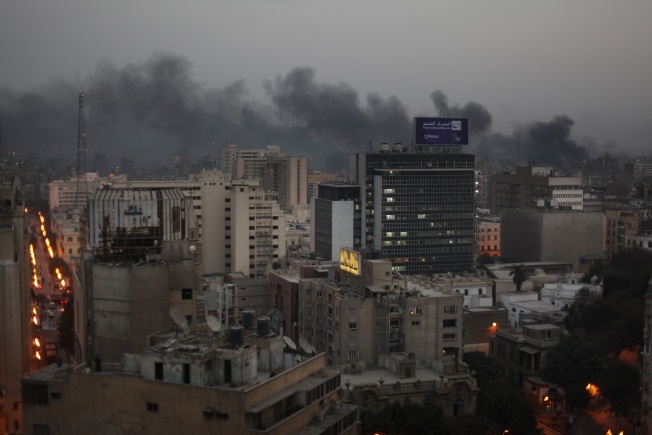 Until calm is restored in Egypt, analysts said, the oil markets will likely remain volatile. Even then, the risk of further unrest in the region will remain. "I think the Saudis have a tighter lid on the country than Mubarak in Egypt," said Senor. "But that doesn't mean it won't give some people ideas who will start speaking up and going to the streets. Even if it's containable, it could have market-moving impact."